Even if you cannot build a campfire, you can make this easy no-bake cookie recipe. Though not quite a sandwich like the traditional campfire treat, these bars mimic the original in layers – a base of graham cracker, followed by roasted (in this case melted) marshmallows, and topped with chocolate. Line a 13 x 9 baking pan with foil or parchment paper, allowing the ends of the liner to drape over the ends of the pan. Spray the liner lightly with cooking spray. Set pan aside. Make the bottom layer: Set 4 tablespoons (1/2 stick) butter and marshmallows in a large, heavy cooking pot. Melt the butter slowly over low heat and then add 3 cups miniature marshmallows. Stir continually until marshmallows are melted and the mixture is smooth. Remove the pan from the heat. Add graham cracker cereal to the mixture. Stir until all cereal pieces are coated. Pour mixture into the prepared pan. Use a greased spatula or your wet fingertips to press the mixture evenly into the pan. Make the middle layer: use the same pot. (Disclaimer: The Elf doesn’t even wash it.) Melt 8 tablespoons (1 stick) of butter over low heat. Add 6 cups miniature marshmallows. Stir until marshmallows are melted and the mixture is smooth. Remove the pan from the heat. Mix in the rice cereal, stirring until pieces are coated. Add the remaining 3 cups of miniature marshmallows to the rice cereal mixture. Stir until they are incorporated. Spread the rice cereal mixture over the graham layer, using the same method to spread and press it evenly. Make the top layer: sprinkle the chocolate chips evenly over the bar cookie surface. Set the baking pan in the heated oven for 5 minutes, allowing the chips to soften and adhere to the cookie surface. Remove the pan from the oven. Allow cookies to sit for 30 minutes to set. You can place the pan in the refrigerator 15-30 minutes or longer to speed up the process. Mix each cereal layer thoroughly, making sure that cereal pieces are well-coated with the marshmallow mixture. Otherwise, pieces won’t adhere to eat other and the bars will fall apart. Work quickly. Marshmallow mixture cools and gets stringy as you mix it. Keep your fingers from getting sticky by pressing mixtures into the pan with a piece of waxed paper. 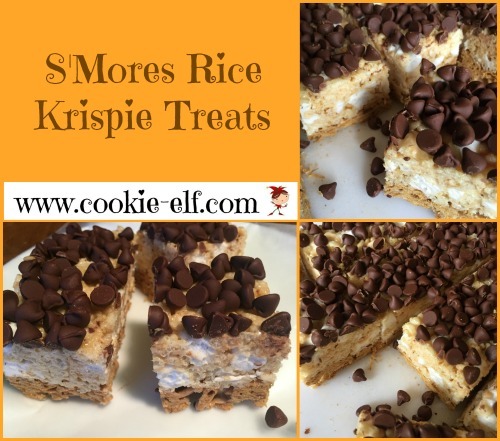 Get more baking tips for Rice Krispie Treats here. See more Rice Krispie Treat Variations on our Pinterest board.